Part 1 of this blog gives an overview of the geometry-based Web Services we developed. Part 2 dives into some of the interesting details for the implementation of such Web Services. This part discusses the deployment specifics of such Web Services. Restart the WebLogic Managed Server after these steps. Also see the following OTN forum post for the NoClassDefFoundError error. This blog series shows how to create geometry based Web Services that can be deployed on Oracle WebLogic Server. Oracle provides functionality in several of their products and frameworks to ease development of such applications. These include geographical data types in the Oracle Database and specific geographical converters in EclipseLink. Part 1 of this blog gives an overview of an end-to-end example of a geometry-based Web Service. This part dives into some of the interesting details for the implementation of such Web Services. The details are discussed per component that was named in part 1. You can use the SDO_UTIL package to insert GML into SDO_GEOMETRY types using the SDO_UTIL.FROM_GMLGEOMETRY and SDO_UTIL.FROM_GML311GEOMETRY functions. See the Oracle Spatial Developer's Guide for more information on the SDO_GEOMETRY type. In the ORM layer we map database table rows to POJOs and vice versa using JPA. 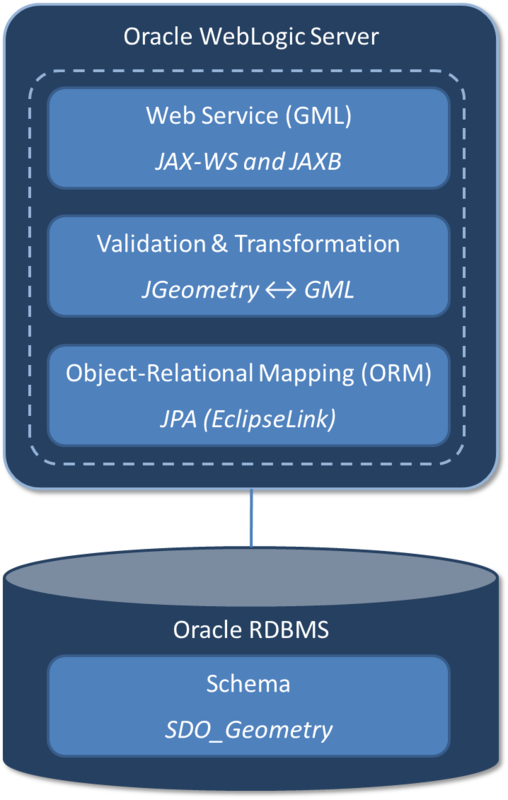 JPA implementations such as EclipseLink provide out-of-the-box mappings between most common Java data types and database columns. To map more exotic and user-defined Java objects you can use Converters in EclipseLink. You can either use an out-of-the-box converter that is shipped with EclipseLink, or code one yourself by implementing EclipseLink's Converter interface. For more information, see this blogpost by Doug Clarke. In this case we need to map the SDO_GEOMETRY database objects to some sort of Java geometry object. Luckily, EclipseLink ships with an out-of-the-box Converter that maps the SDO_GEOMETRY type to a JGeometry object. The JGeometry class provides all kinds of convenience methods and attributes for working with geographical data. This class is part of the Oracle Spatial Java functionality. 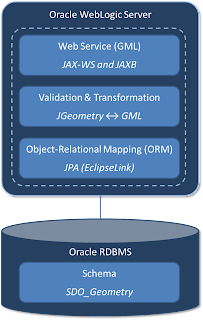 It can be used only for Oracle Spatial's SQL type MDSYS.SDO_GEOMETRY and supports Oracle JDBC Driver version 8.1.7 or higher. Annotate the JPA entities and attributes. The JGeometry class and associated Java classes are contained in the sdoapi.jar and sdoutl.jar files. They can be found in the library directory of your Oracle RDBMS installation. Also add the ojdbc JAR to the classpath. Next, add the StructConverter annotation to the JPA entities containing geometry attributes. The StructConverter is a specific type of EclipseLink converter that provides out-of-the-box mappings to Oracle RDBMS struct types. The org.eclipse.persistence.platform.database.oracle.converters.JGeometryConverter provides the actual mapping logic. The name attribute of the StructConverter needs to be same as the attribute value for the Convert annotation. In our use case, we had a predefined Web Service interface and used a top-down approach to generate Java classes based on the existing interface. You can use the wsimport tool to generate the JAX-WS artifacts including the Java WebService class from the WSDL. Note that in this end-to-end scenario the service is exposed as SOAP Web Service. It is simple to expose the same functionality as a RESTful service. You can use JAX-RS annotations instead of JAX-WS annotations to create a RESTful service that exposes geographical data in GML format. See the following example that shows how JPA and JAX-RS can be combined to create RESTful services. This layer, among others, provides the logic to map between the JAXB generated classes for the GML elements and the JGeometry objects. Unmarshall the GML String into the JAXB generated classes. The GML3 class and supporting code can also be found in the sdoapi.jar and sdoutl.jar files. Read about the deployment specifics for this geometry-based Web Service on Oracle WebLogic Server in part 3 of this blog.